Jim Gracey (right) launches the Belfast Telegraph Sports Awards with Chris Nelmes, Boulevard Centre Manager (left). The Belfast Telegraph Sports Awards are back for another year, with plenty of our biggest names vying yet again for our top awards after another stellar year for Northern Irish sport. Last year it was motorcycling superstar Jonathan Rea who walked away with top honours by winning Sports Star of the Year and he’ll have his eyes on repeating the feat after winning a fourth consecutive World Superbike Championship. This year there have been a few changes, while we’re delighted to announce we already have a few new sponsors on board to make these the best Belfast Telegraph Sports Awards yet. And, of course, as always we need your help and nominations to decide who is the most deserving of our awards, and this year it couldn’t be easier either with the option of nominating someone online. Each category will be ruled upon by our expert panel of judges, who will collate the final list of winners who will be presented with their prizes at the Belfast Telegraph Sports Awards ceremony, which this year will once again be held at the Waterfront Hall in Belfast on Monday, January 14. Nominating someone you feel deserves an award this year is easier than ever as you can do it online! For the first time, we have set up a form on our website that will allow you to submit your nomination with ease — all you need to do is determine which award best suits the nominee from the list below and click the “Nominate now” link. Guidelines have been provided within each form to help you put together your submission. Entries will close on Thursday, December 6. This award is given to a person from the province whose sporting performances or achievements are deemed to be outstanding. This category applies to high performance athletes in both the able-bodied and disability spheres. Recent winners have included Jonathan Rea, Carl Frampton, Michael Conlon and Rory McIlroy. This award is given to an individual aged 19 or under on 31st December 2018 and identified with the province whose sporting performances or achievements are deemed outstanding. This award is given to a team aged 19 or under on 31st December 2018 within the province whose sporting performances or achievements are deemed outstanding. This category is open to grassroots teams and individuals within the province who are involved in a recognised category of sport for people with a disability, whether as performers, organisers or supporters. This is a female only category which aims to recognise an individual woman (age 18 and over) who has made an impact on the Northern Ireland sporting landscape in the past year, making it better and stronger for females. It is open to female athletes, coaches, administrators and is accessible for all levels of sport, from grassroots to professional. The award is sponsored by Electric Ireland. This awards recognises a sporting individual who has made a spectacular rise during the past 12 months. This award is made by the sports writers of the Belfast Telegraph. This category is awarded to a young competitor who has progressed in his or her field to the extent that the winner can confidently be expected to fulfil their potential at the top level in their sport. This award recognises special achievement at grassroots level. Nominations can be for clubs and/or individuals. This award recognises an Ulster sportsperson whose contribution to sport through the years has been outstanding. This award recognises outstanding achievement and is an additional award agreed by the judges. At the judge’s discretion more than one award may be presented. So what are you waiting for? Nominate your local sporting heroes today and join us at our gala event to find out who the winners are! Catch the highlights from the 2018 Belfast Telegraph Sports Awards at the Waterfront in Belfast. By Allan Preston Local sporting heroes were dressed to impress last night at the annual Belfast Telegraph Sports Awards. 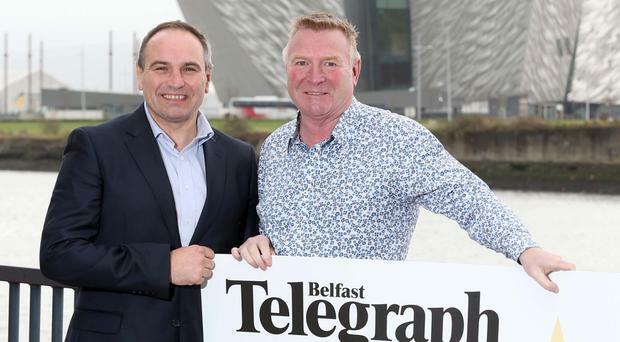 By Roy Harris Emotions ran high during last night's Belfast Telegraph Sports Awards in the Waterfront Hall as the late William Dunlop was posthumously inducted into the Hall of Fame.